Phew. This past week has been devoted to tracking down the date that the Detroit News printed a delicious pineapple pound cake recipe. Allow me to take you through the process that we undertook to attempt to put this tasty recipe in a historical perspective. First, we visited the Detroit News’ Web site. The home page gave me the option of perusing the last seven days or looking into the Rearview Mirror at the photo store of Michigan’s yesteryears. I could find nothing beyond that, not even a basic archive search. Then I tackled ProQuest and Lexis Nexus. Lexis Nexus Academic doesn’t have the News, nor does it have the Free Press. The Daily Yomiuri, yes. Detroit News? No. I finally had to contact my talented copy editor friend, Benita, to help me out. She found the archive search page at detnews.com, which was a battle in and of itself, but even that only went back a year. 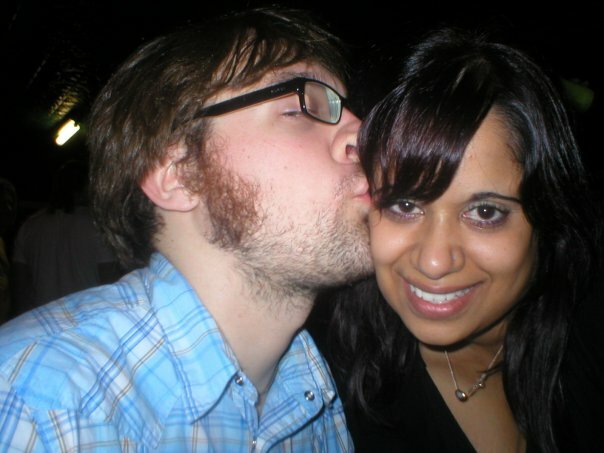 The lovely Benita with Freep copy editor Dan Austin, Detroit’s biggest fan. She hooked me up even further and went through the News’ internal archives, but those only went back three years. “The font recipe exchange is totally ’80s type,” said Benita, which would obviously put us back much further than three years. We seemed to be a dead end. I sent off an e-mail to Neal Rubin, metro columnist at the News. I thought he might be able to unearth something Benita didn’t, because he often writes posts about figuring out random stuff. I also knew him from a high school internship, and we stayed in one-e-mail-a-year touch, so it seemed like a better option than contacting someone random in the News’ library. Recipes aren’t indexed as far back as this one goes. What I do know is that [reporter] Andrea Wojack worked for the News prior to the JOA, which means before 1989. So we know that it was, indeed, from the late ’70s or the ’80s. I just found out today what Wojack is doing now, so I’m planning on contacting her soon. Not that she probably remembers this one particular recipe, but it’s worth a try. Bottom line: At some point in the 1980s, the News printed a fantastic recipe for pineapple pound cake. I can wager a guess that the Detroit News reduced its free archived content because it wanted a way to make more money from the Web site. But how can it make money if it won’t even tell me what it has hidden in its archives? I just skirted disaster when I attempted this recipe, as I was under the mistaken impression that a “tube pan” was just a longer, thinner version of a loaf pan. I needed a ten-inch tube pan and my loaf pan was 9 3/4″, so I assumed I’d be close enough. I called Mom to confirm, and was surprised to discover that a tube pan actually means a Bundt cake pan. Whoops! Clearly, my background weighs more heavily on the reporting side than the baking side of this endeavor. That crisis averted, I cautiously brought my laptop into the kitchen so I could bake. 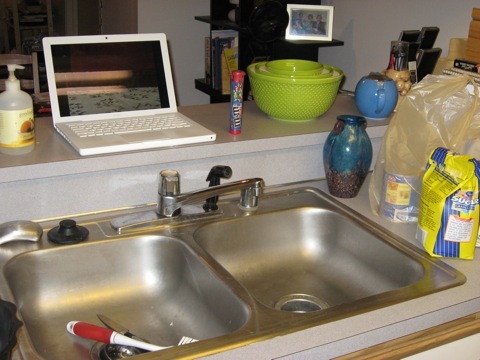 My MacBook meets my kitchen. The recipe was crazy easy, and although I was skeptical about the pineapple glaze (because it looked pretty gross), the finished product was remarkable. And now, you can make it too! 1. Don’t preheat the oven! 2. Cream together shortening, butter and sugar until light and fluffy. Add eggs, one at a time, beating thoroughly after each addition. 3. Sift flour with baking powder and add to creamed mixture in small quantities, alternating with milk. 4. Add vanilla and stir in crushed pineapple. Blend well. 5. Pour batter into well-greased 10-inch tube pan. 6. Place in cold oven. Set the temperature to 325 degrees and bake 1 1/2 hours or until cake springs back in pan when lightly touched. 7. Let cake stand a few minutes in pan, then loosen and invert on rack. 8. 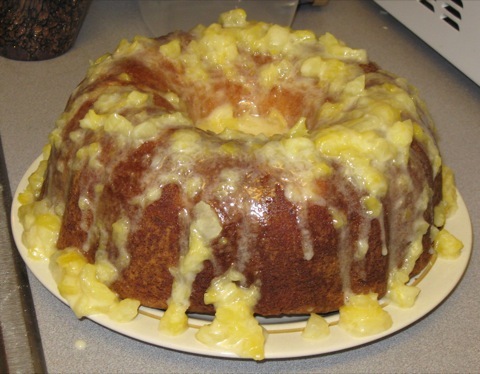 For glaze, combine butter, sugar and pineapple. Pour over warm cake. Cool before serving. • We had regular canned pineapple on hand, but it’s worth it to go out and get diced/crushed pineapple instead so you don’t have to mess with a food processor or anything. • Obviously, this cake needed to be placed on a larger plate. Don’t make the same mistake we did, as we came dangerously close to a glaze disaster. • A big THANK YOU to Benita and Neal for all their help! And just think, without my mother obsessively saving recipes, this one would have been lost for all eternity. Coming up: the history of the Bundt pan revolution, and a test kitchen adventure. Whoops, it should be salt — I fixed it! Thanks for the catch. I remember cutting this recipe from the Detroit New’s and baking this unbelievable pound cake. I didn’t realize how long it’s been until I read your article. It’s been baked many times but the last few years I’ve had to cut back on the sugar intake. But I’m breaking out the mixer and bowls tonight and when it’s done I’ll share most of it with co-workers. Back in the day, I’d load up some Cool Whip on a warm slice or two, then pour a tall glass of cold milk and just almost die. Besides German Chocolate cake, this may be my favorite. Um……German Chocolate???? It would have been helpful if the recipe matched the directions. I made this cake only to discover the directions called for adding the vanilla and adding baking powder…neither which is listed in the ingredients list. What I did was use self rising flour and I added vanilla to taste, about 1 teaspoon full. I also made the glaze with just the juice in the glaze not the fruit….it was delicious!!!!! !